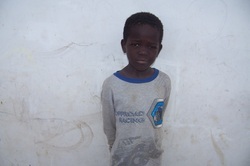 Joshua is a sweet 8 year old boy, who like so many Zambian children, is very small for his age. He lives with his mother and 2 siblings. Joshua's mother says that she doesn't know where his father is or if he is alive, as he ran away from the family after 4 years of marriage. Life is a constant struggle for the family. His mother does 'piece work' as a maid, which means she only works once in a while on an 'as needed' basis. Rent and food are always hard to come by. The family of four lives in a one room house. This is a small cinder block room. These 'houses' are typically the size of a very small bedroom in a typical small house in America. The family struggles for food. The mother tries her best to feed the children twice a day, but some days, she can only manage a meal once a day. Joshua gets breakfast and lunch at school, Monday through Friday. Thanks to the generosity of his sponsor, we will take him shopping for clothes and shoes, this weekend. We will also be able to provide the family with food on a monthly basis. Joshua had a fabulous time on his shopping trip! He especially loved the trampoline!